We’re going to take advantage of all the new snow and hit the slopes this weekend, what are you up to? I can’t believe it’s almost 2013!!! 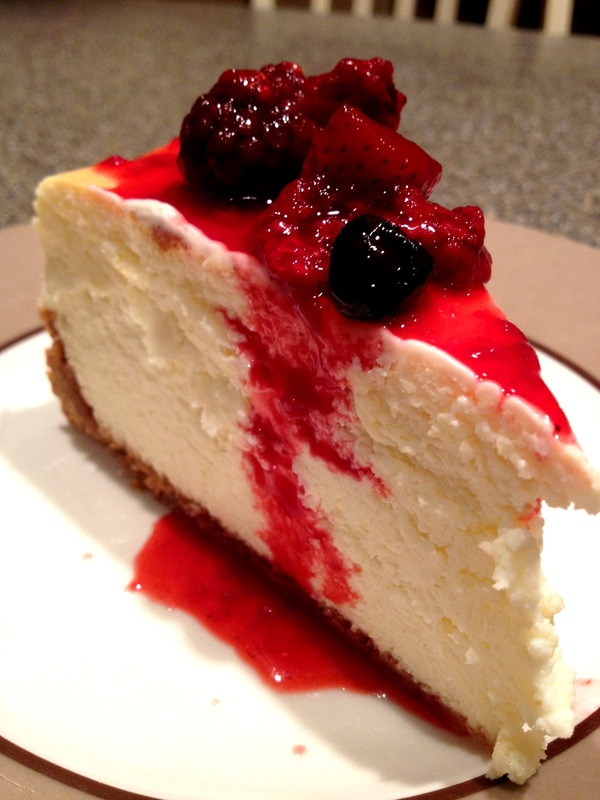 The last of our Christmas Eve cheesecake…it was SO good, Martha’s recipe, of course. New Year’s Eve cocktail recipes! All this Neiman Marcus/Target stuff is 50% off! Can’t wait for the Girls season premier 1/13! And of course Downton Abbey returns on 1/6 …but uh-oh, Matthew Crawley is not returning for Season 4! 1. NYE headband and noisemaker; 2. Topshop tunic tank (worn tucked in); 3. 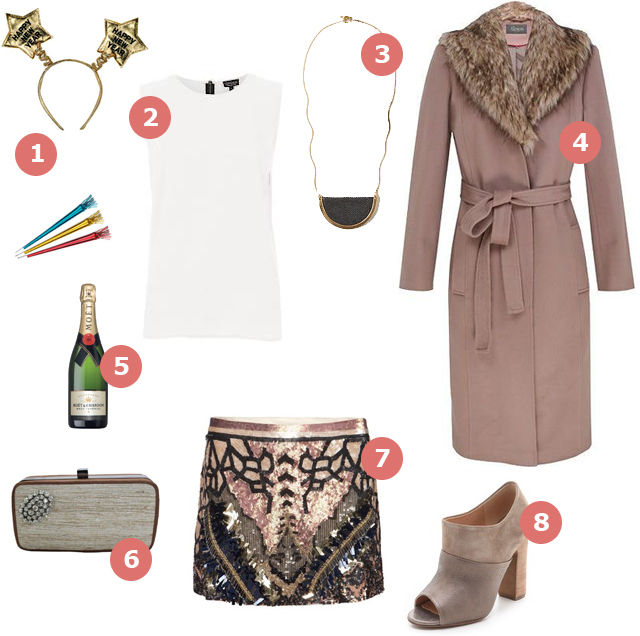 Interesting necklace from Anthro; 4.Fur collared coat; 5. Champagne, of course; 6. Jeweled clutch; 7. All Saints glitter-y mini skirt; and 8. Booties. 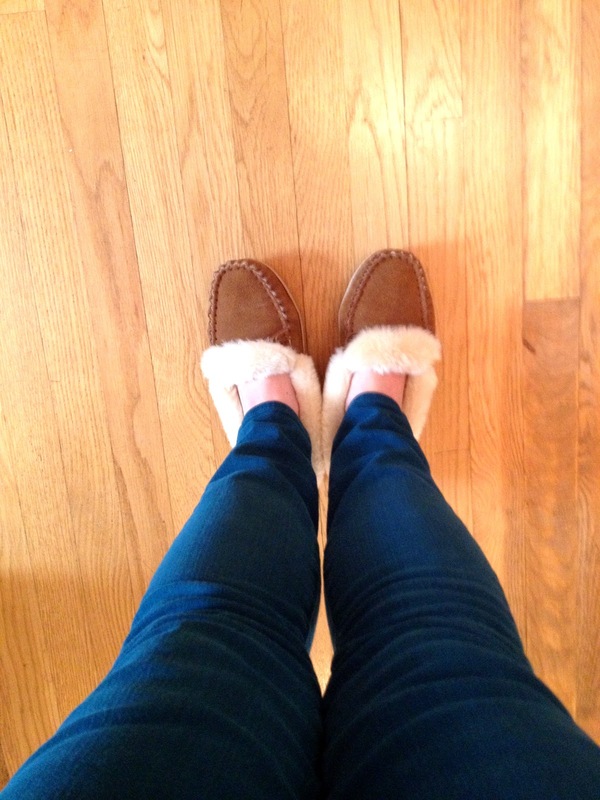 Wearing some Christmas presents today – teal green jeans and cozy slippers! 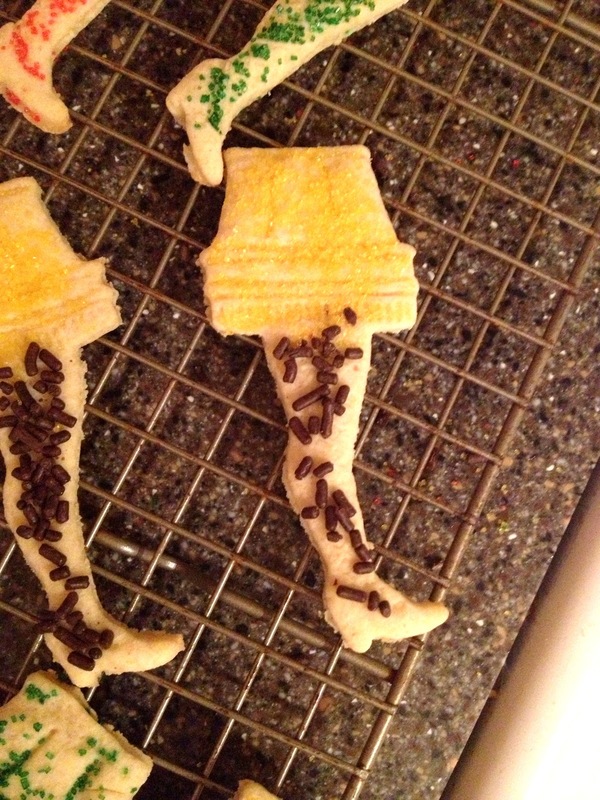 Just a batch of leg lamp cookies we made for my father in-law, the biggest A Christmas Story fan…ever. 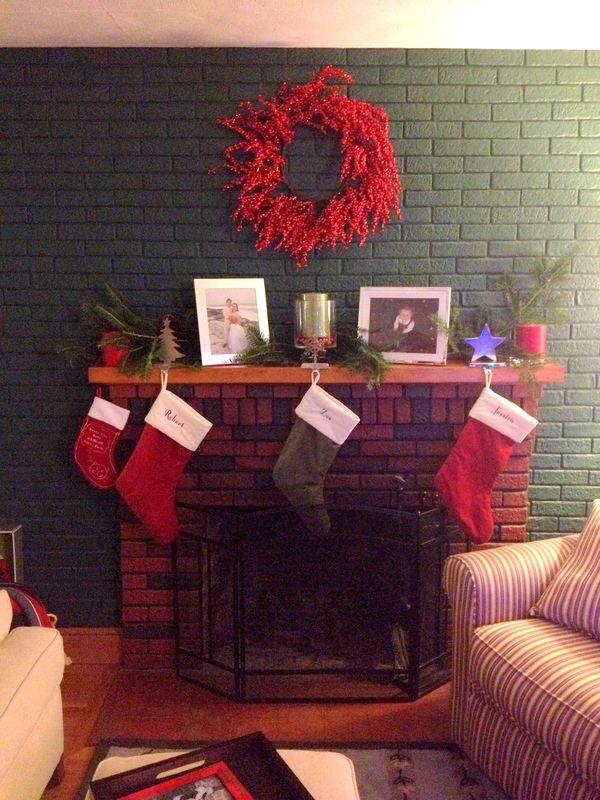 Here’s what I’m wearing this Christmas Eve (once all the cooking and baking is done) – my favorite green bow cords from J. Crew, a navy blouse-y top, sparkle-y shoes, my nice jewelry, and a little red with silver sparkle on my nails. Merry Christmas Eve! Almost Christmas! We’re finalizing everything this weekend and visiting some family so we’re back home by Christmas Eve to assemble some toys, have Christmas Eve dinner, and head to church. Have a great weekend, here are a few fun links from around the web! This is an icky new trend happening at Broadway shows, gross. Beauty Queen or nun? What an interesting life decision. And last, here are a few ways to help Newtown. So many people travel over the holidays that I thought I’d put together a little ensemble of what to wear whether you’re going by train, plane, or automobile. I like to dress in layers when we travel because you never know if you’ll be too hot or too cold. Safe travels! 1. 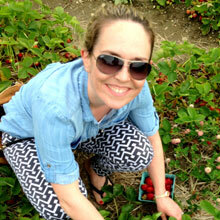 J.Crew chambray shirt; 2. H&M white tank; 3. & 4. Travel nourishment and a giant bottle of water; 5. Big cozy sweater from Quiksilver; 6. Warm, comfy leggings from American Apparel; 7. 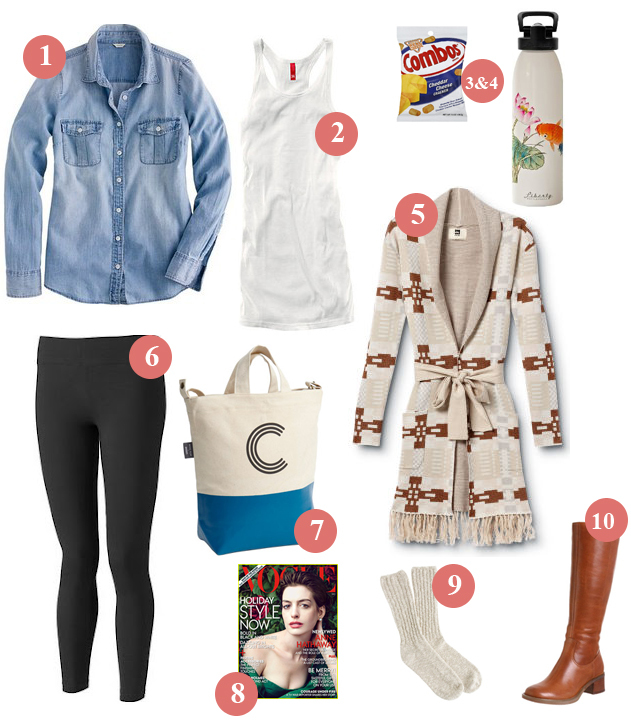 Baggu Bag for all your miscellaneous item; 8.The latest issue of your favorite magazine; 9. Cozy socks for when you take your boots off; and 10. Rockport boots.